Are your transition times slow? is this because of a stubborn wetsuit? We’ve all experienced that before. So here are my tips for making transitions easy and smooth. 1. OIL YOURSELF UP: Spray the crap out of your legs, ankles, arms, wrists shoulders with trislide or in some cases Body Wash/Pam. Yup, ya heard me, Pam. These oily substances will help the wetsuit come off faster when you are ripping it off your body. 2. TUCK IT IN: Keep your watch and chip tucked underneath your wetsuit if you can. If it is the type of wetsuit that is sleeveless or shorter in the legs, then make sure you spray yourself by it. This will help prevent anything from getting stuck while you are taking off your wetsuit. 3. WHERE AM I? : During open transition in the morning, count out which row your bike is in and how far in, maybe even stick something bright in the aisle to point it out to you. And if you have a separate swim in and bike in entrance, make sure you count which row you are in from both directions. This will help you from getting lost when you are all discombobulated after your swim and bike. 4. SPEED IT UP AND CUT IT OUT: Figure out ahead of time what you need to do in transition and IF it is absolutely necessary. Yes, I am talking about the buckets you need to sit on to take off your wetsuit, dry off with a towel, drink some fluids, eat something and put on your shoes. It is a waste of time. Now if you are elderly (sorry) then I forgive you sit down and take a break, but if you want a faster time, then speed it up by cutting it out. Put your gels on your bike, drink fluids on your bike, attach your shoes to your bike if you have mastered that art, and let the wind dry you off. This will cut your time immensely. This is really the only way you will get better as becoming faster in transition. 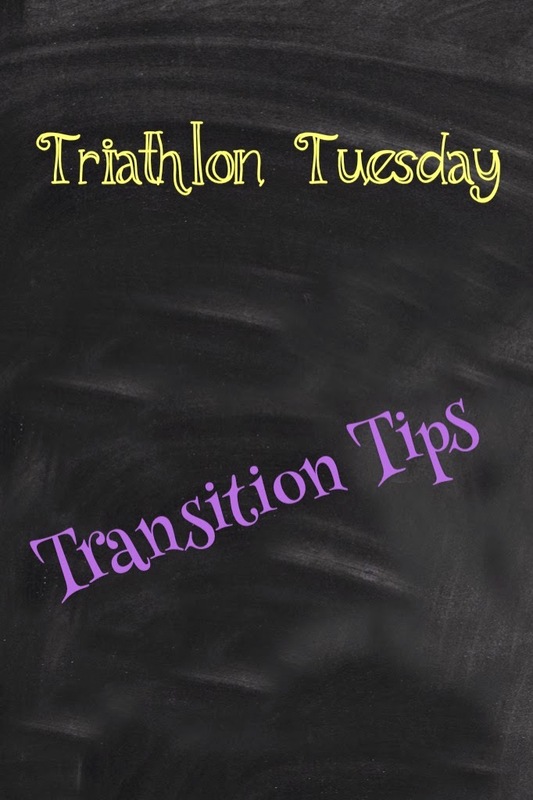 Do it at a tri club SBR workout by practicing with the wetsuit and helmet, or after a bike workout practice putting on your running shoes immediately even if you aren’t going for a run. And as always grab your belt and hat (if you are wearing one) as you run out of transition, so you can put it on while running. This will all help to cut down your transition times and if you are like me, get them under 1 minute!